Congratulations on choosing South Carolina as your wedding locale! 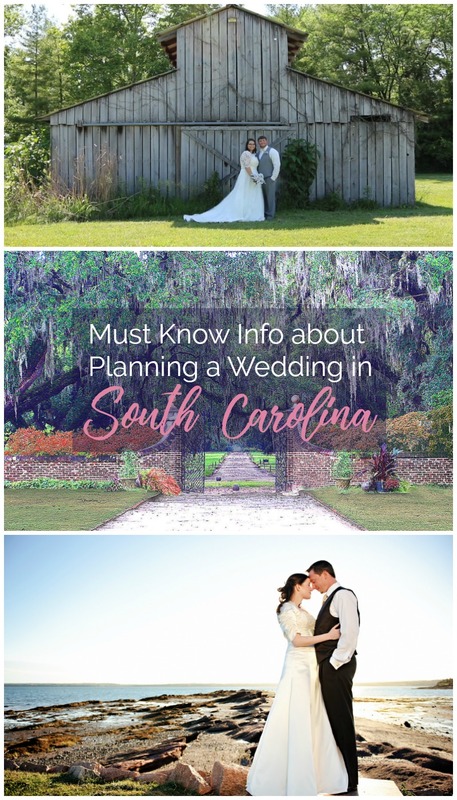 Before you buy your dress, book that photographer, or even start looking at ceremony sites, here are the must-know essentials about planning a wedding in South Carolina. 1. Charleston, a historic town on South Carolina's coast, is a seriously popular travel destination. Charleston has been named the top U.S. city to visit for several years running--and even took the top spot of best cities to visit in the world. Plus, it continually tops lists of romantic cities in major magazines like Martha Stewart Weddings and Travel + Leisure. What does this mean for you and your soon-to-be spouse? If you want a Charleston wedding, expect to pay premium prices when compared with weddings elsewhere in the state, and be prepared to plan at least 6 months out. Many of the most popular wedding venues and vendors book up more than a year in advance! As soon as you fall in love with a wedding photographer or that beach front ballroom, you'll want to call to see what dates are available. If you find a date that works, pay the deposit immediately since there might even be a waiting list for your wedding date! 2. During the summer, things get hot and steamy...and we're not talking romance-wise. Regardless of where you plan to have your ceremony and reception, know that South Carolina heat and humidity is no joke. From May to September, temperatures soar into the 80s, 90s, and even into triple digits. Take this into consideration when you're planning an outdoor wedding: either plan to have plenty of water and fans available for your guests, or consider moving your nuptials to another time of year. P.S. You might want to reconsider the layers of tulle on that dress for a summertime wedding as well. Light, breathable fabrics will be your best friend. And don't throw out the idea of a knee-length or tea-length dress! 3. Be wary of the details on a South Carolina beach wedding. While being married on the shore while the sun sets in the distance might seem like the perfect way to begin your union, you'll want to be very, very careful about the rules set out on each beach. Some South Carolina beaches are fine with wedding parties and require only an application and fee (Folly Beach is one), while others completely outlaw any type of professional business conducted on the sand (such as Isle of Palms, where restrictions include no commercial photographers at all). Severe fines come along with breaking the rules, and no couple wants to waste their honeymoon savings on an avoidable fine! 4. Most locations have a short 3 day waiting period between your wedding application date and the issuance of your marriage certificate. The quick and easy process can be completed at any county courthouse. If you live out of town, you'll want to arrive several days before your wedding date to finalize those details: make a stop to the local clerk of court your first item on the last-minute to-do list. Then, pick up the marriage certificate a day or two before your wedding, and you'll have everything you need to make your marriage legal. 5. Winters are usually very mild. While this means no opportunities for snow covered backdrops, you'll be excited to discover that you can sport that sleeveless dress even in January without a heavy coat over it. Most year, it doesn't fall below freezing but a handful of times (if that! ), so South Carolina is an excellent option for those who want a wedding during the winter months without the threat of being snowed in. 6. Spring and Fall are peak wedding seasons here in South Carolina. When you're planning a wedding in South Carolina, know that April, May, June, October, and early November are the most sought after wedding dates. The weather is warm, but not scorching. The foliage across the state is lush and green by April and stays that way well into October. While the lower part of the state doesn't see distinctive fall foliage until mid-November, the Midlands and Upstate are awash in colors by the end of October. 7. Plan around hurricane season. While hurricanes should always be a consideration, actual landfall of one is fairly rare. The last major hurricane to make landfall in South Carolina was Hurricane Hugo in 1989: there have several other minor hurricanes since then, but most are a few days of wind and rain. Minor hurricanes aren't enough to derail a wedding, though you should always have a backup plan with indoor space just in case. In the event that you plan a wedding during hurricane season (which runs from June 1 to November 1 each year), check with your event planner and venues to see what plans you should have in place. Ask if you will be able to reschedule the event or get your money back in case a catastrophic hurricane comes through on or just before your wedding date. What type of South Carolina wedding are you hoping to have? If you've already finished planning a wedding in South Carolina, what did you wish you knew before starting your planning?